It’s time for a secret recipe clubrecipe! This month I got Nicole from http://dailydishrecipes.com/. Nicole is “a Writer. Blogger. Photographer. Mother of 5. Social Media Junkie. Crafter. Frugal Gal.” Sounds busy to me :). After looking through the recipes this one stuck out to me! 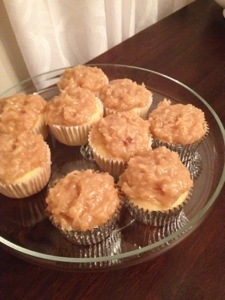 Caramel, coconut, cupcakes, yum! Husband and I both found these yummy! The little people haven’t tried them yet! I just want to lick all that yummy frosting off. Thank you for nice recipe. Take a break from your hard work and moving. Love the combination of coconut and caramel!